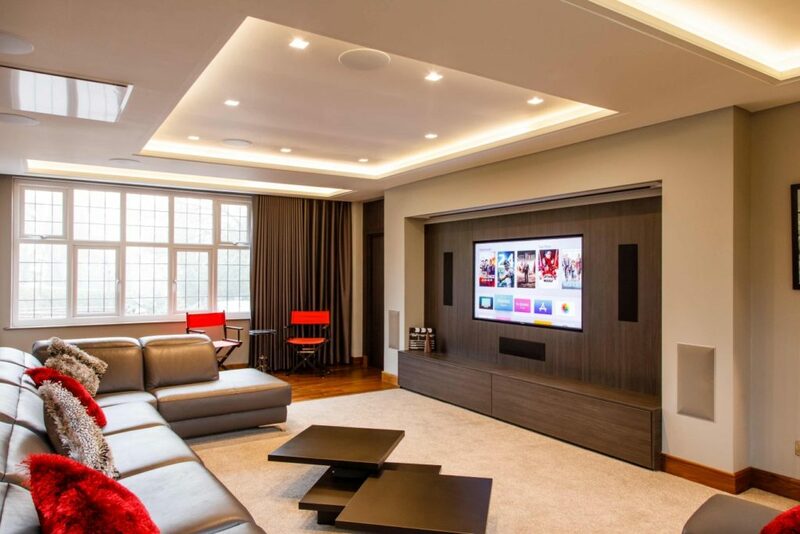 Our clients were looking to create a high quality family media room in a large former lounge in their home. 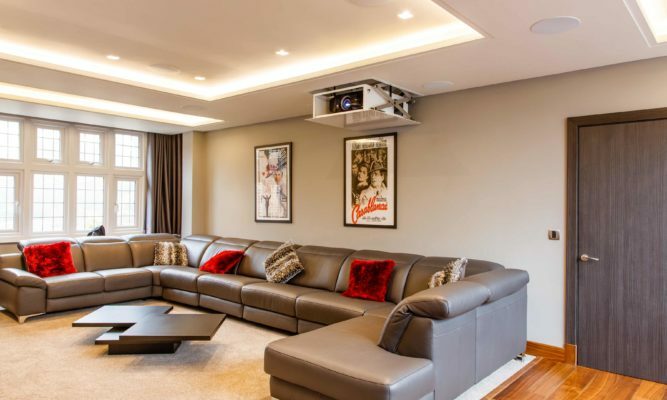 The brief was a complete turn key solution to deliver and manage all works and to create a room that could serve both as a comfortable day to day TV lounge whilst also providing a high quality big screen movie experience when required. 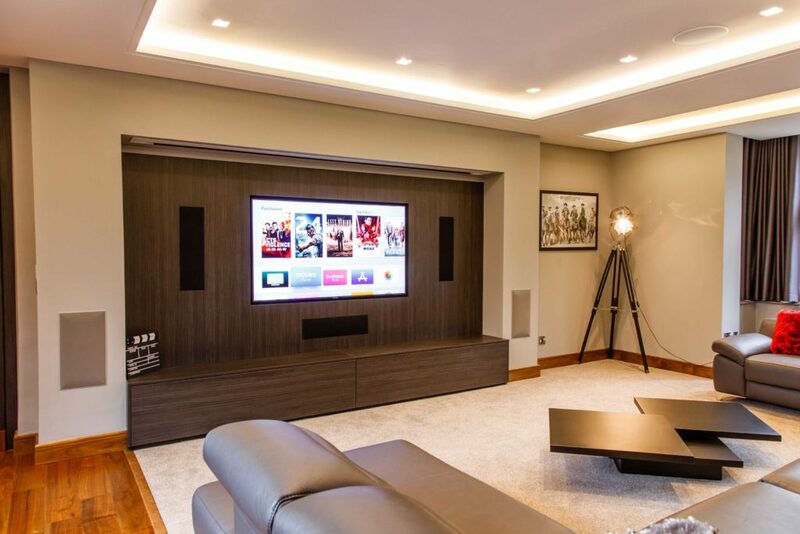 To deliver the room Finite Solutions managed the project end to end with engineers first fixing all lighting and AV cabling and our build team creating the suspended ceiling and applying the double acoustic board and green glue acoustic compound and plastering the room shell. 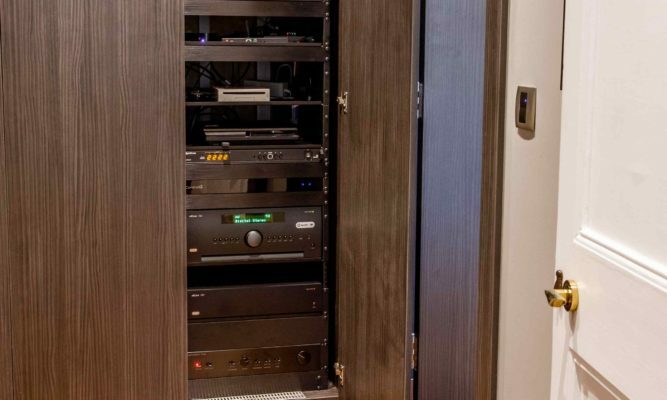 Our joinery team then laid the new oak flooring and built the cabinetry on the media wall and the adjoining room to house the Av rack. Upon completion of the room shell Finite Solutions engineers fitted all the audio visual equipment and light fittings and commissioned the room to ISF and THX standards for optimum performance. 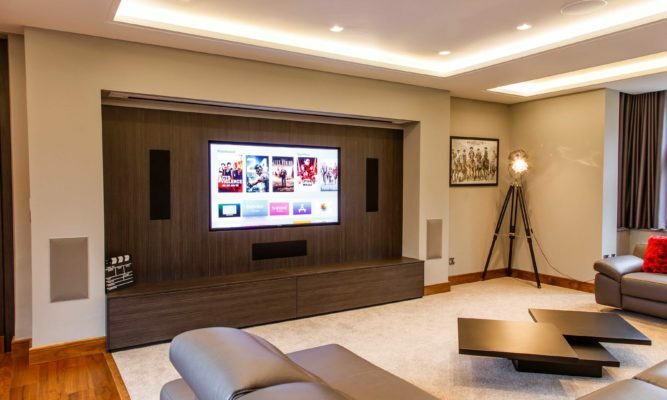 Featuring Arcam processing and amplification, B&W 800 series in wall and ceiling speakers and in wall subwoofers in a 7.4.2 configuration this room delivery superbly powerful and detailed surround sound. 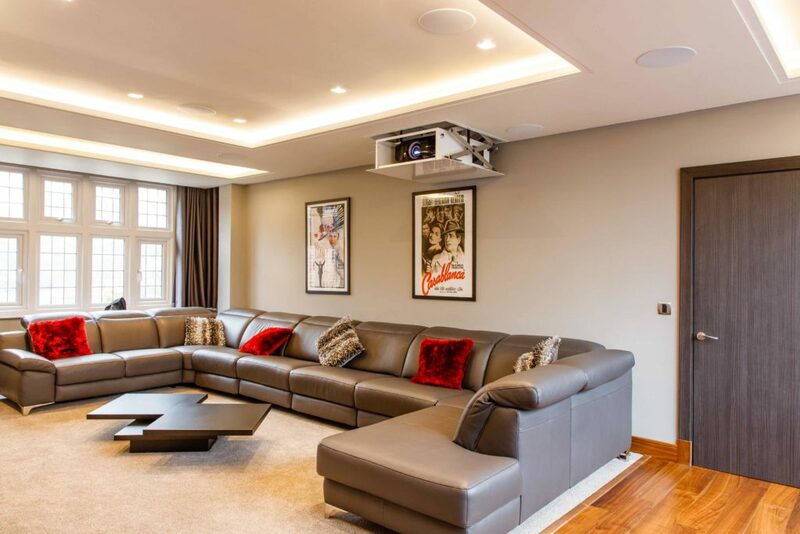 The video system utilises a 75″ Sony 4K TV and a Sony 4k projector with a screen research drop down trap door screen. 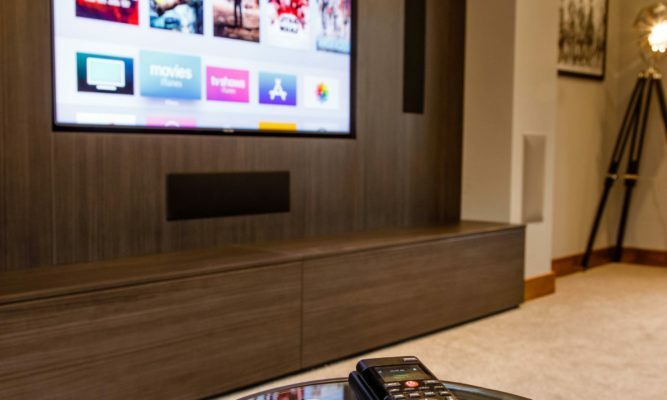 The System was fed with Apple TV 4k, Amazon Fire 4k, Sony 4k Blu-Ray player and Sky 4k. 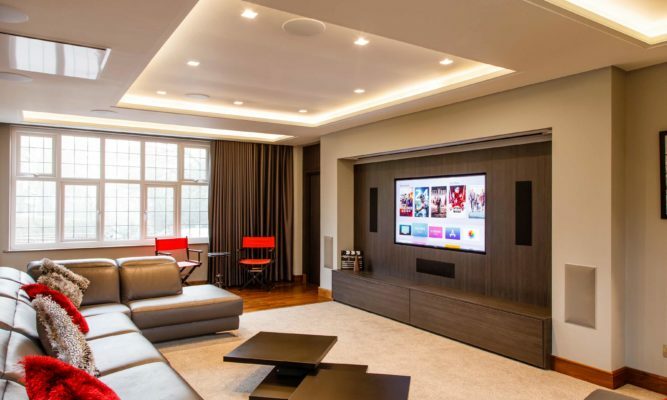 All control is via Control 4 which provides simple operation of the audio visual system, Lutron lighting and silent gliss curtain tracks in the room. 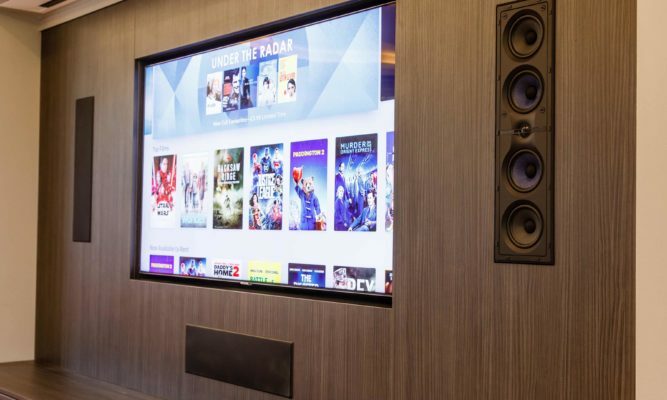 The end result is a high performance room that delivers equally well as a relaxed day to day TV lounge and high fidelity big screen movie system. 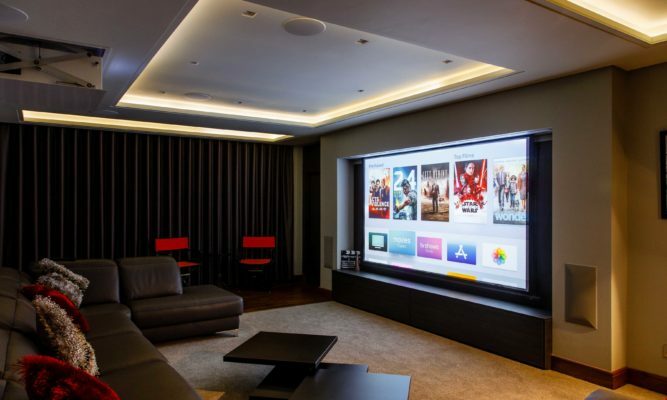 Control is slick and easy to operate from either remote or tablet and the room is used by the clients every day making the investment great value for money.